Nobody should have to explain this to headline writers and editors, but here it goes: If you state that three people were killed in a gun attack, readers will understand that the three people were targets of an armed attack, not the perpetrators of one. That’s just how our language works. It turns out that the article in question comes from Reuters. But the Reuters headline is as follows: “Three Palestinians attack Israelis in West Bank, shot dead: army.” Isn’t that much more straightforward and clear? Why, then, did The Forward opt for a different, misleading headline? When a Voice of America headline stated, “Afghan IS Leader Killed in Drone Strike,” it of course didn’t mean the ISIS leader was busy piloting a drone when he was killed. It meant he was on the receiving end of a drone strike. Likewise, the VOA headline “180-200 Kenyan Soldiers Killed in January Attack” was not a story about an attack by the Kenyan troops. It was an attack against the soldiers, who were at their base when al-Shabab militants targeted them in an offensive. So when the VOA announces in a headline that “Three Palestinians Killed in West Bank Attacks,” it informs people — wrongly — that Palestinians were attacked, when in fact they were the perpetrators of the attacks against Israelis. How best to whitewash the fact that a Palestinian terrorist indiscriminately targeted every civilian he could attack and actively murdered an innocent American tourist, a young US army vet, who was taking a peaceful stroll in the city of Jaffa? First, erase the identity of the perpetrator, and definitely do not identify him as Palestinian. Second, use the passive voice when mentioning the tourist’s death, as if it were accidental, without association to any specific perpetrator. 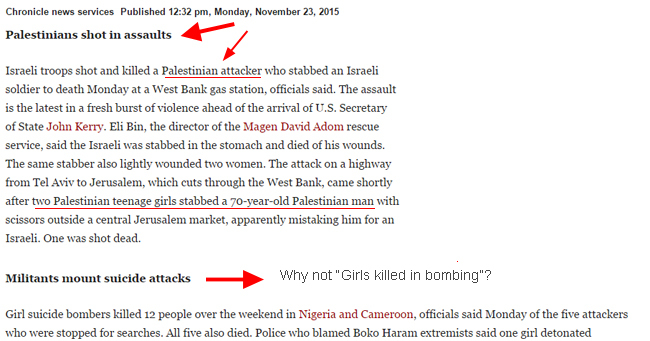 And voila, you can distort the news to whitewash the disturbing truth about Palestinian terrorism. The article, as well, conceals the identity of the Palestinian perpetrator until near the end (the 10th of 14 paragraphs) and then presents it as an Israeli claim. 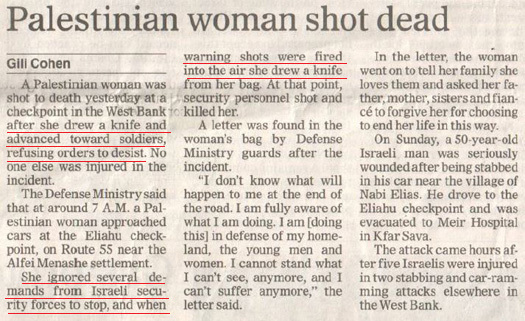 The Army Times.com takes similar pains to conceal the identity of the perpetrator, referring only to an “Israel” attack in the headline and saving mention of the perpetrator’s Palestinian identity until well into the 5th paragraph of the article. The article itself described four attacks against Israeli Jews by Palestinians or Arab citizens of Israelis. Like CBS (see immediately below), the Philadelphia Inquirer ran an Associated Press story about a Israeli police officer shot dead while presumably stopping a planned Palestinian terror attack. And like CBS, Philly’s newspaper wasn’t content with the fair and straightforward headline suggested by AP. Two female police officers were injured, one critically, when heavily armed Palestinian assailants shot them at close range. The critically injured 19-year-old officer later died of her wounds. Not to be outdone by its American counterparts, The Times (of London) runs a headline about the killing of an attacker — but without noting that he was an attacker. The newspaper went even further to ensure the AP story it was summarizing had an anti-Israel bias. The original AP story explained in a paragraph that “Israel says the bloodshed is fueled by a Palestinian campaign of incitement” and that “Palestinians say it stems from despair over nearly 50 years of occupation.” But The Times removed the first half of the paragraph. Why doesn’t the newspaper want readers to understand Israel’s view of the situation? The girl, as the article made clear, was shot by a security guard “after she ran at him with a knife.” The attack was caught on video. 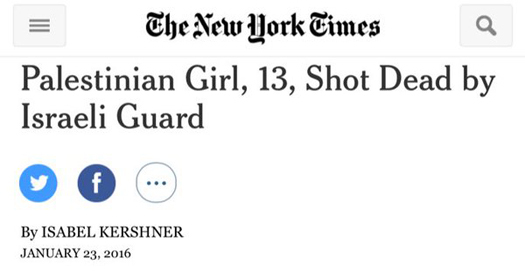 Although the newspaper later changed its online headline to “Palestinian Girl With Knife Killed by Israeli Guard, Police Say,” the print copy of the newspaper used the misleading headline. 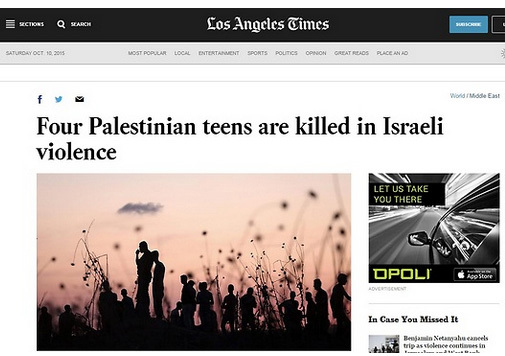 The LA Times news brief was adopted from a longer AP story, which ran under the straightforward headline, “Israel army: 3 Palestinians killed after attacking soldiers.” Informative, that headline is. Two Israelis died Dec. 23 after a stabbing attack by Palestinians outside Jerusalem’s Old City. The attackers were shot and killed by Israeli police, as was one of the Israeli victims, who was mistakenly hit as police tried to neutralize the attackers. The other Israeli died of multiple stab wounds, and a third was badly injured. 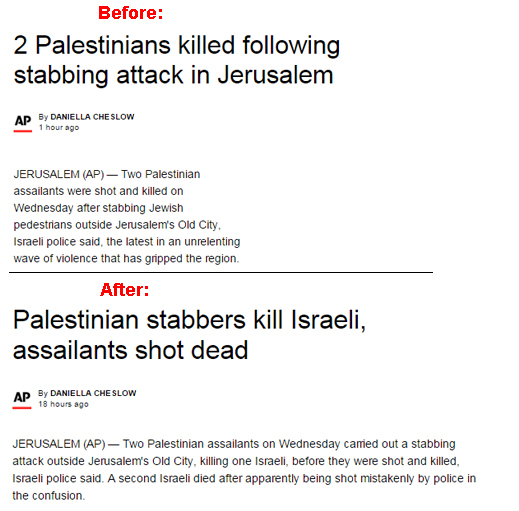 An Associated Press headline about the Palestinian terror attack failed to mention the Israeli victims, neglected to specify Palestinians were the attackers, and instead conveyed to readers that it was Palestinians who were killed in a stabbing attack. After two Palestinians who rammed vehicles into Israeli soldiers were killed by troops on the scene, New York Times readers would have reasonably concluded that the Palestinians were the victims of the hit and-run attacks, which wounded 8 Israelis, as opposed to the perpetrators. 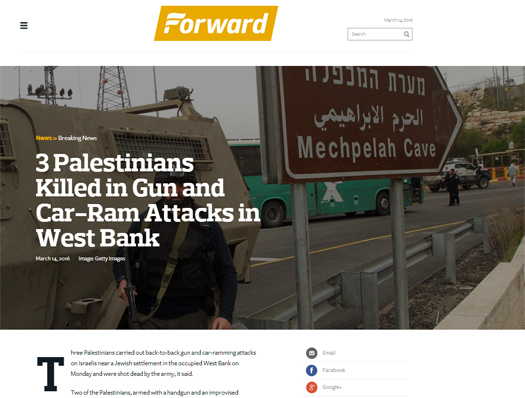 The headline was: “West Bank: Palestinians Killed After Hit-and-Run Attacks.” Following communication from CAMERA, editors improved the headline. 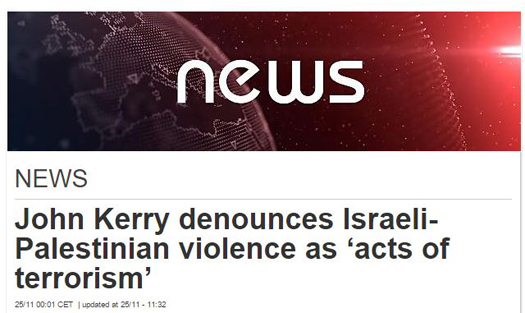 But Kerry was not referring to “Israeli-Palestinian violence.” He was referring specifically to the attacks by Palestinians which have claimed innocent Israeli lives, and not Israel’s use of force against the attackers. After facing criticism for its misleading headline, EuroNews commendably corrected its headline and similar language that appeared in the article itself. 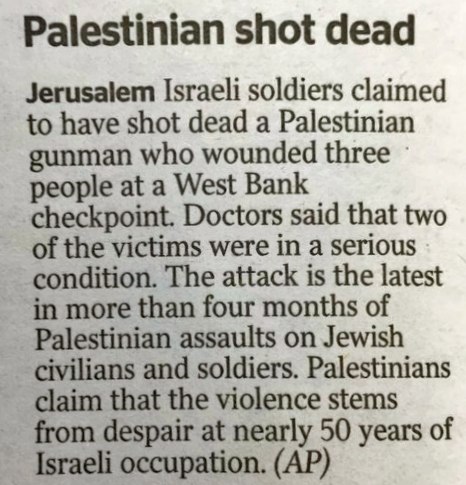 The headline “Palestinians shot in assaults” clearly conveys that Palestinians were assaulted, then shot. In fact, they were shot while attacking Israelis (or so they thought — one of them mistakenly stabbed an elderly Palestinian man before being shot). 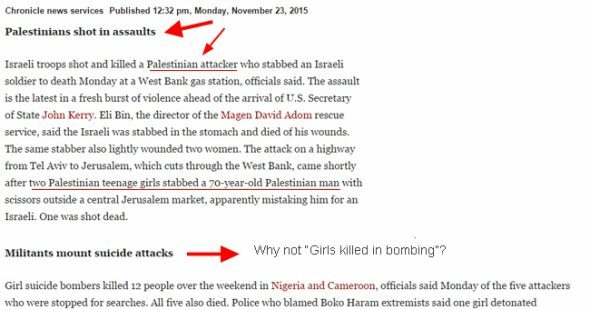 If the San Francisco Chronicle website were to be consistent, it might have headlined the brief that followed, about attacks by five female Boko Haram suicide bombers, “Girls Killed in Bombing.” But they weren’t consistent. 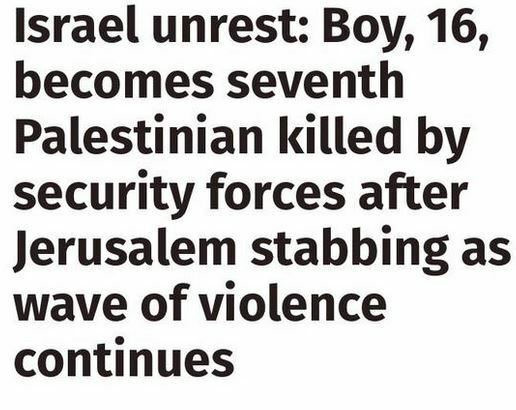 It seems headline writers seem to suddenly lose their touch when reporting on Palestinian violence. Palestinians “died at the scene of attacks on Israelis,” as if they were innocent bystanders caught in the wrong place in the wrong time, as opposed to the perpetrators of said attacks. The many visitors to CNN’s Web site who only glance at the headline and don’t read the article would reasonably understand that Israel is the perpetrator of terror. In fact, Oren Leibermann’s accompanying article describes Palestinian terror: the series of recent Palestinian attacks, “unplanned, uncoordinated and largely unpredictable, using knives or other sharp objects, making them difficult to prevent.” He also describes the Palestinian terror that preceded this new wave: the suicide bombings, rocket attacks and tunnel attacks. 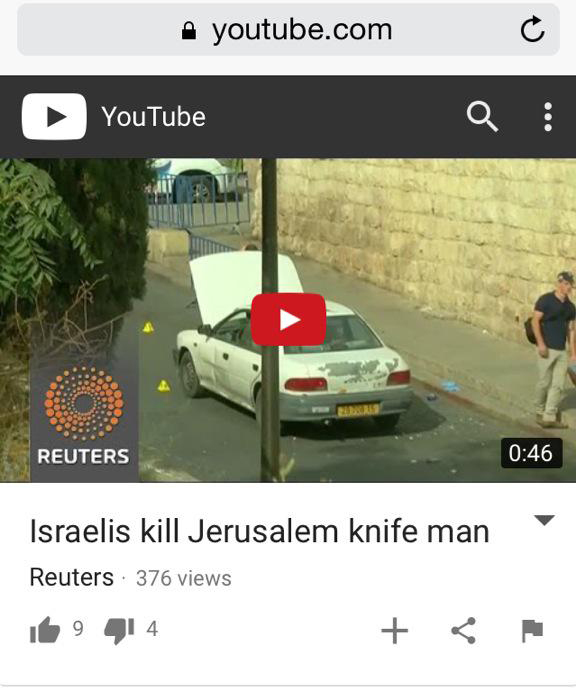 Reuters photo captions refer to Palestinian stabbing, shooting and ramming attacks against Israelis as “Palestinians confronting Israelis.” The above caption, for instance, states: “A Palestinian woman supporting the Islamic Jihad movement holds a copy of the Koran as another holds a knife during a rally in Gaza City to show solidarity with Palestinians confronting Israelis in the West Bank and Jerusalem.” If the recent spate of stabbings, shootings and rammings are Palestinians “confronting” Israelis, how exactly would Palestinians attack Israelis? Following earlier photo captions which whitewashed Palestinian attacks against Israelis as “Palestinians confronting Israelis,” Reuters’ graphics department has come up with new terminology for Palestinian stabbings, shootings and ramming attacks against Israeli civilians and security forces: “street violence.” Were Israeli and Palestinian gangs of errant teenagers duking it out in “street violence” in Raanana, Petah Tikvah, Tel Aviv, Beit Shemesh, Beersheba, and more? CNN: “Palestinians shot boarding kids’ bus.” But not really. 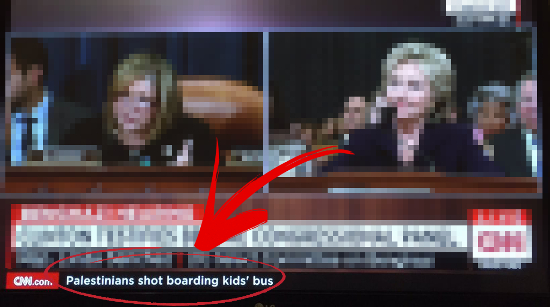 rding a kids’ bus, the network’s ticker informed viewers watching news of Hillary Clinton’s congressional testimony. Not quite. What actually happened? Two Palestinians attempted to board a school bus carrying a group of children. The driver didn’t allow them to board. So instead they, and the knives they were armed with, went down the street, found a Haredi Jew, and stabbed him several times. Police arrived on the scene and shot the pair. CNN: Joseph’s Tomb site spontaneously combusts. 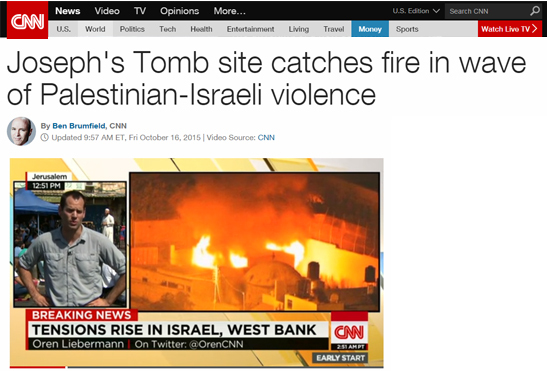 “Fire broke out overnight at the compound housing Joseph’s Tomb, a religious site venerated by Jews, the Israel Defense Forces said Friday,” CNN’s story begins. And it’s true. The holy site did catch fire. Right around the time Palestinian arsonists set it on fire. 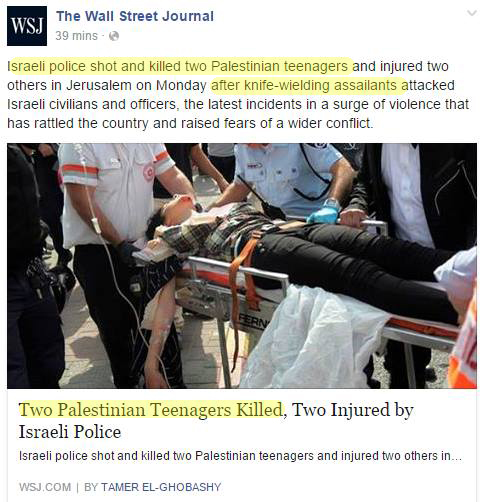 Wall Street Journal Facebook post: Palestinian teens shot. Separately, a “knife-wielding assailant” is on the loose. Also relevant, but inexplicably unmentioned in the post: The Palestinian teenagers shot by the police are actually the very same knife-wielding attackers described in the vague Facebook blurb. One of those attackers had just stabbed a 13-year-old Jewish boy on a bike. The newspaper eventually revised its headline to “Israeli Police Fatally Shoot Two Palestinian Teen Attackers, Injure Two Others.” See? That wasn’t too hard. MSNBC: He was in a rush. 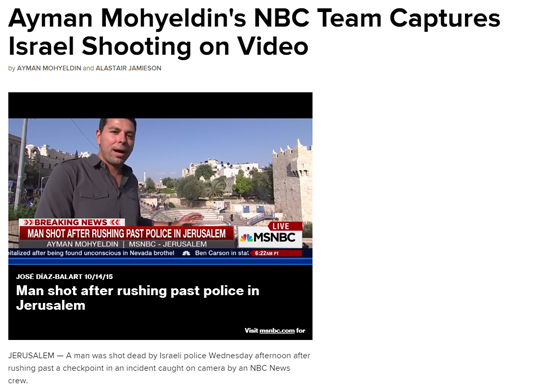 “Man shot after rushing past police in Jerusalem,” is the way MSNBC headlined its report about a Palestinian who was shot. While wearing army fatigues. 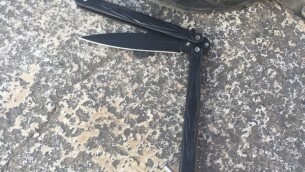 While brandishing a butterfly knife and, yes, “rushing” toward Israeli security guards with that knife. Los Angeles Times: “Israeli violence” strikes down Palestinians. New York Times: The asphalt is under attack. “Pelted the road“? 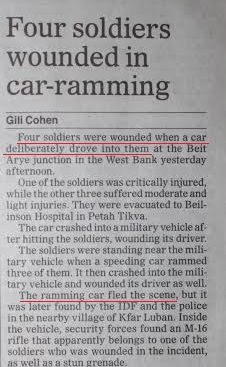 The newspaper couldn’t bring itself to admit, either in the headline or the lede, that Palestinian attackers stoned Israeli cars, not Israeli “roads.” The identity of the “attackers,” moreover, was not specified anywhere in the article. Al Jazeera: Knife-wielding injured woman is an unarmed dead woman. Independent: So many words, so little information. New York Times: Israel going around accusing people of things. Palestinian leader Mahmoud Abbas announced on television that Israel had “executed in cold blood” a Palestinian. In fact the teen, Ahmad Manasra, who had just gone on a stabbing spree, is very much alive, convalescing in an Israeli hospital from where he has reportedly confessed to his attacks.